Home / Careful choices / Airbnb Social Impact Experiences – token gesture or major breakthrough? Airbnb has been making clear its ambition to become a much bigger beast in the travel industry. Its aim is to become nothing less than a one-stop-shop for your entire trip, with a seamless process of booking your travel (still to come), your accommodation, and then filling your trip with experiences. Mostly, those experiences help you to get the most from the place that you’re visiting. Get a cocktail class in Paris. Or a talk by a gourmet chef after you’ve sampled the food. You get the idea. But Airbnb has now also launched what it calls Social Impact Experiences. They may involve you doing some local volunteering. Or they may simply introduce you to the valuable work that’s being done by a local not-for-profit, with the fee being the part that makes a difference. Want to be part of a re-enactment of key moments in the history a Capetown township? Or watch young people being trained in boxing, and then get to try a few of the moves yourself? Or help Habitat for Humanity renovate an elderly person’s home to make it safe and comfortable? This can now be part of your travel itinerary. At one level, it’s hard to find fault with this. It makes it easy for the (mostly) young people who use Airbnb to find interesting ways to give to the community. It encourages them to think about the real people who live in the places they visit. And Airbnb seems to have learned from some of the mistakes of volunteer-tourism in the past. For instance, they don’t offer links with orphanages, which have been the source of problems in the past. And by making it genuinely easy to decide to go to a place and then make a positive difference while you’re there – that could be a real boost to the amount of such activity that takes place. It could be a first step in changing the sub-culture so that social impact becomes an expected part of every adventure. The barrier right now is that it’s not that easy. That’s probably a reflection of the fact that on day one there is only a very small set of social impact opportunities on the system. 12 cities currently (Detroit, London, Paris, Nairobi, Havana, SF, Cape Town, Florence, Miami, Seoul, Tokyo, and Los Angeles) expanding to 50 next year. Right now, it’s actually quite hard to browse what social impact opportunities might exist in any one place. It may be easier once you’ve booked your stay, but that assumes that social impact opportunities won’t influence your choice of where to go. 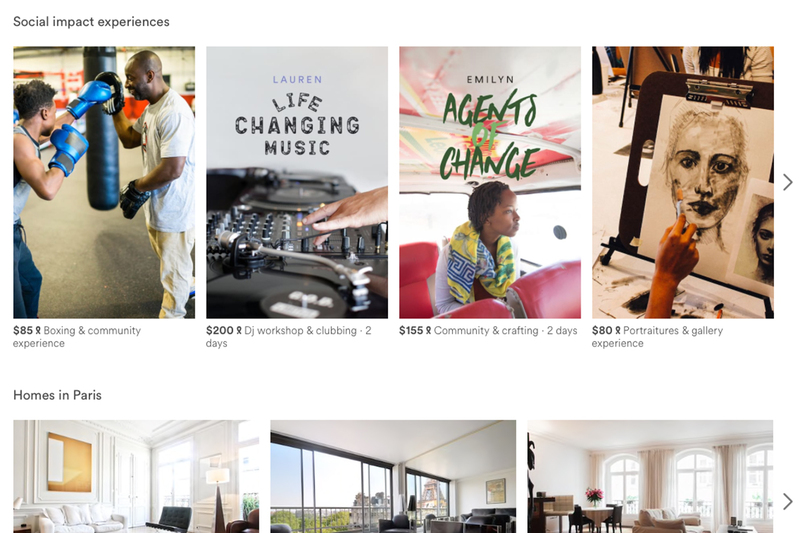 As things currently stand, Airbnb waives its fees for booking social impact experiences. That means that 100% of the fee charged goes to the non-profit. If that weren’t the case, no doubt there would be a significant backlash. However, it’s hard to offer something at zero charge and drive it to scale because obviously there are resources involved in providing the service. But so long as it remains a sub-set of the broader experiences on offer, which ARE charged, then perhaps it’s sustainable as a feature that appeals to its loyal core audience. But not every non-profit that claims to be furthering the social good is actually doing that – and no doubt there will be times where social impact experiences will lead to some controversy. It may end up being that the resource cost that makes a zero fee unsustainable will actually arise from policing the integrity of the causes that benefit. In the mean time, it’s a potentially powerful option for the conscious traveller. Certainly as it becomes a more widely spread phenomenon, I could see myself using it when I travel.